Imagine the fattest man you’ve ever seen, make him exceedingly handsome, charming, clever and gallant, Italian, and a Count, add a wardrobe of brightly patterned waistcoats, and then pour in a healthy dose of Machiavellian cunning and manipulation. This gives you Fosco, one of literature’s more complex and vilely attractive villains. He’s one of several characters that will invade your mind and distract you from your day job when you allow yourself to wonder into the strange, secretive and dangerous world of The Woman in White. His sidekick is the deeply duplicitous Sir Percival Glyde – once handsome, now balding, nasty and brutish, but capable of the genteel politeness necessary to snare himself a very rich wife. The trio of infamy is completed by Madam Fosco, a dark presence constantly at her husband’s side, quietly rolling his cigarettes, watching his back, and doing his evil bidding. Ranged against these mercenary fortune hunters are half-sisters Laura Fairlie and Marian Holcombe, living a sequestered, quiet but relatively happy life in their uncle’s manor house. Life gets a little complicated for them when their new drawing master, Mr Hartright, a lovely, unassuming chap, falls madly for Laura and simultaneously captures the young lady’s heart. This is awkward enough given that they come from different social classes (a big no-no in 1850s England). But the real spanner in the works is Laura’s engagement to Sir Percival. Mr Hartright retreats to London, heart-broken and ashamed at his presumption, leaving the path clear for Sir Percival to really turn things upside down. For a moment, Laura looks like she might think better of the marriage – there’s her broken heart to consider, and the ominous, anonymous letter warning her of Sir Percival’s true dastardliness. But the wedding goes ahead, and minutes into the honeymoon, Laura realises that the scandal of marrying down would have been far preferable to life with the malicious Baron and the sinister Count and Countess. Luckily, she is able to keep Marian by her side – a far wiser and more courageous woman than Laura ever aspires to be. The ethereal presence of a third woman, in appearance rather like a haggard shade of Laura herself, dressed all in white, seems to promise a possible way out of their doom. This woman in white hints at a terrible secret, which will destroy Sir Percival and set the sisters free. But the Count pounces on the ghostly waif, and it is left to the sisters themselves, with the timely help of the beloved Mr Hartright, to extricate them from their doom, and bring the evil-doers to justice. 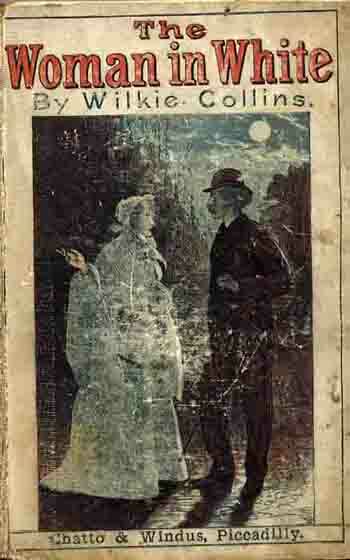 The Woman in White has been appropriately lauded as the forerunner of the modern suspense novel. It’s a gripping read from start to finish, which will have you longing to abandon your desk and return to its pages as you puzzle over hidden identities, murky motives, and that dreadfully elusive secret that has Sir Percival so worried. This entry was posted in Book Reviews, Uncategorized and tagged 1850s, London, mystery, suspense, Wilkie Collins, www.bookdrum.com. Bookmark the permalink.